Krishna Greens Westmist Phase II, a gated community spread on an area of 40 acres, yelawala – Mysore. It’s the best opportunity to be part of green township where Idyllic, luxurious living meets 21st century amenities. Nested amidst swaying trees, winding walkways and chirping birds, what you will discover here is an inspired and holistic lifestyle. This group offers premium plots, luxurious spaces well connected to the key parts of Mysore Highway and is designed to offer a high quality, peaceful and Déjà vu Feeling. This premium plot is located opposite to the Rare materials plant and just a few kilometers is ITC Tobacco. Great amenities supplied with underground electrical supply lines, sufficient capacity water tank, spacious playground for children to relax, well planned water source, highly maintained individual sanitary and water lines, great drainage system. It’s a premium plot project which is in close proximity to several prestigious gated communities, reputed schools and shopping malls. 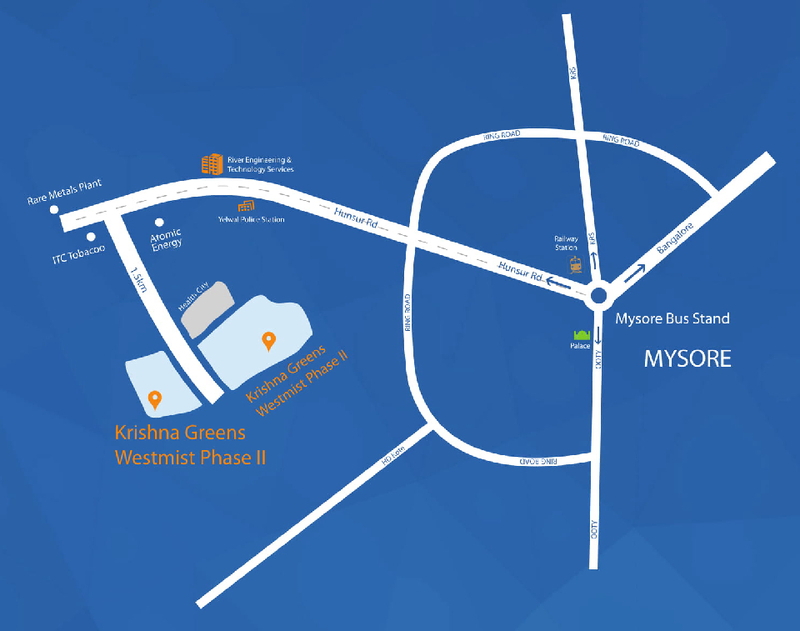 The ideal location of the project is in Mysore, which makes it the most preferred and prosperous investment opportunity. Time required for completion of layout will be about 48 (fourty eight) months. Allotment of plot will be done on a first-come, first-served basis. Those interested in booking a site in Krishna Greens Westmist Phase II can make the payment in favour of 'The Bangalore Employees & Self Employees Housing Co-Operative Society Limited' via cheque/DD or pay order payable at Bangalore. Registration Charges extra as per government rules. The booking of a plot in Krishna Greens Westmist Phase II will be accepted once the amount of Rs.50,000/- paid as the down payment. The remaining balance amount must be paid in monthly instalment as per the given payment chart. Time required for completion of layout will be about 60 (Sixty) months. Allotment of plot will be done on the first-come, first-served basis. The members who are interested in booking of the site can make the payment in favour of "THE BANGALORE EMPLOYEES AND SELF EMPLOYEES HOUSING CO OPERATIVE SOCIETY LTD" through cheque/DD/NEFT/RTGS only. Krishna Greens Westmist Phase II is a kilometer away from Yelawala and is located opposite to the Rare Rare Metals Plant and adjacent to the ITC Factory. It is just 15 km from the Mysore bus stop and is among the most rapidly growing localities in that region.